Communifire is the intranet software that's easy for you and your employees to use. It helps your organization work smarter, by powering company wide collaboration, communication, and internal knowledge sharing. Collaboration and communication tools are the foundation of building the best intranet software for your company or any business. Large companies tend to invest sizable budgets on developing their intranets to encourage greater collaboration, but you don’t really have to look very far to see how you can get there too, without having to spend a fortune. Jakob Nielsen published a brilliant report on the 10 Best Intranets of 2014 ... which highlights not just the best examples of business intranets, but also the latest trends and directions businesses are taking with their intranets. Social networking platforms and features are among the key ingredients of a good intranet platform. The most symbolic instantiation of this trend might be at Deloitte Touche Tohmatsu, where employees can add their own videos to the corporate TV network. The ability to add and share photos, videos, blogs, and collaborate on discussion groups is the evolution of the best company intranet software available today. It’s the way most professionals enjoy communicating and collaborating outside the business environment ... on Facebook, MySpace, YouTube, Skype or Twitter among others. While very large organizations may still need to explore developing their own intranet from the ground upwards, small to midsized businesses can surely find all they need to collaborate the smart way. After all, every business is a social network in itself anyway, right? What is the Best Intranet Software? Connecting your employees is one of the most important things your business can do today. As technology continues to have an immense impact on how employees handle the workday, the benefits are certainly balanced by a number of challenges. Just as the Internet has made it easier than ever for employees to communicate and share ideas with each other, the fact that people can work remotely means a certain amount of connection can get lost in the shuffle. While there are a number of ways to keep staff members connected and engaged with each other, the modern intranet is perhaps the best tool for the job. An intranet can be viewed as an organization's very own social community, allowing members to communicate, collaborate, share files, schedule conference calls, and much more with just a few clicks. It doesn't matter what category a business falls into in terms of industry - a well-designed intranet will always be beneficial. Take one look at the current landscape of intranet solutions, and the first thing you'll notice is the market is flooded with many different options. For the average business owner, knowing which route to take can be exceptionally confusing. This is especially true with the marketing jargon being thrown at consumers by software companies touting their solutions as the best intranet software. The sad fact of the matter is that a great deal of these intranet applications are nothing more than template-based copies of one another. Most people are familiar with the "one-size-fits-all" concept that often applies to web design (ie: template-based websites), and anyone who has actually employed such an option can likely attest to the fact that this type of solution doesn't do much good for a business. Every organization is unique, which is why the concept of designing a website or a piece of software that could fit any type of business without adaptation is so misleading. Companies sell these products and services and tell their customers that they're getting what they need, but in the end, they're overlooking the importance of customization and flexibility. Communifire sets itself apart from the competition in a number of ways, chief among them being the fact that is designed with scalability and customization in mind. Rather than following the cookie-cutter approach that has become so commonly found throughout the industry, an intranet created with Communifire can be tweaked and customized in countless ways to best fit the business it represents. The result is a piece of software that knows few limits, and one that can help to take any business's internal processes to the next level. Without further adieu, here are seven reasons why Communifire is the best intranet platform, each of which set it apart from the multitude of other social intranet options that are currently flooding the market. 1. It Gives You Complete Flexibility. Fully Customizable. It's important to view any business as a living entity in and of itself. Just as human beings experience change throughout their lives, so do businesses in every industry. A business can grow and change dramatically over time, so it's often necessary to switch-up the ways certain processes are handled. A solid intranet platform, then, is one that offers as much flexibility as possible. When a one-size-fits-all approach is employed, there's always a good chance that a company will outgrow its intranet. If this occurs, the resulting issues can be enough to derail an organization and may be difficult to overcome. Communifire offers the utmost in flexibility, allowing you to scale things up or down depending upon the needs of your business. It's one of the most overlooked aspects of any piece of software, yet the importance of scalability for today's growing businesses simply cannot be emphasized enough. For many years now, email has been the preferred method for virtual communication in the business world. There are plenty of reasons why people use email on a daily basis to communicate with their colleagues, but more often than not, professionals who rely on email for communication don't even realize the headaches they're causing for themselves. Conversations can get mixed-up, files can easily be lost, and any associated issues can be difficult to move past. Email really isn't the best tool available for communication, and it pales in comparison to communicating through a well-designed social intranet. Central to the functionality of Communifire is the ability to communicate with other members of the community at the drop of a hat. Group and private messaging is as easy as clicking on a community member's name and typing whatever's on your mind. All conversations are archived, eliminating any worries you might have about important details disappearing. Once you and your staff switch to communicating through your intranet, your email inbox will likely become more of a notification center than anything else. No matter how large or small your business may be, there's no getting around the importance of accurately scheduling meetings and events. Every professional has experienced missing an important commitment at least once or twice in their career, and the fallout can often mean losing a potential client, displeasing customers, or creating other potential problems that aren't always possible to fix. To say that your company needs a robust scheduling platform in order to handle daily events, then, would be a massive understatement. Communifire is the best intranet software because it features one of the most robust scheduling platforms. Members can maintain both personal and shared calendars, which helps to ensure that there's never any question about your teammate's or colleague's workload. This is essential to avoid double-booking a time slot, but also to keep everyone on the same page about important meetings and events. It can take a bit of time to flesh-out a calendar with the right details, but once you do, you'll never have to worry about overlooking a scheduled event again. Project managers have their work cut out for them. Seeing a project through from beginning to end can be an extremely difficult process, especially considering everything that can get in the way. The more you can do to streamline how they go about handling project management, the less likely it is that a project will end up dead in its tracks. Communifire can surely serve a number of different roles, but one of its most impressive traits is its robust project management system. You can get a project off the ground, assign tasks to employees, and take things from beginning to end in a streamlined fashion. While many people find themselves struggling to keep even simple projects on track, Communifire allows you to manage complex tasks with ease. Creating high-quality content and executing backlinks is a great way to not only improve your website's SEO but also bring in an entirely new audience. Informative content also makes you an authority in your industry, which can have a huge impact on the amount of respect clients and customers have for your organization. It should stand to reason, then, that every company should have access to a platform that facilitates an easy method of content creation, which is exactly where Communifire comes into play. Communifire features a powerful WYSIWYG editor, allowing you and your staff to create high-quality blogs, articles, and wikis without the need for having any knowledge of HTML or coding. Every member of your staff can easily contribute content to your social community. This can help to create an internal knowledgebase, as well as build a collection of great content that can be used for marketing and other purposes. If simplicity is what you're looking for, there's no better option for content creation within your social intranet than Communifire. Pen and paper document management, numerous filing cabinets, and confusing cataloging systems are a thing of the past. Word processing has all but completely taken over the pen and paper approach that once dominated the business world. The benefits of making the switch have gone on to change the ways in which most organization's operate today. Without a strong document management system, even today's best companies would likely crumble. Communifire allows you to upload files and categorize them rationally without any issue. Files can then be shared and ranked, allowing you and your colleagues to pass documents back and forth with just a few clicks. Document management in Communifire is fast and easy. You'll never have to worry about wasting time with confusing indexes of paper documents. If you and your employees are going to be using your social intranet on a regular basis, it's essential that it feature the most intuitive user interface possible. Navigating throughout a community shouldn't be difficult, and a great deal of time can be sacrificed in the process if you aren't careful. The sad fact of the matter is that many of today's intranet platforms simply don't feature attractive UIs, and the related issues are difficult to ignore. One of the hallmarks of Communifire is that it's exceptionally easy to use. Anyone who is familiar with some of the more popular social media networks will feel right at home. Learning how to get the most out of the software isn't nearly as time-consuming as some may think. Functionality and simplicity combine to make Communifire one of the most attractive, yet powerful social intranet options out there. Communifire may be easy to use, but it's also a robust piece of software that can be utilized to great effect. Getting the most out of your social intranet doesn't have to be confusing, and the benefits are undeniable. So many business owners and managers feel as if implementing a new social intranet is sufficient in fixing the issues they face. 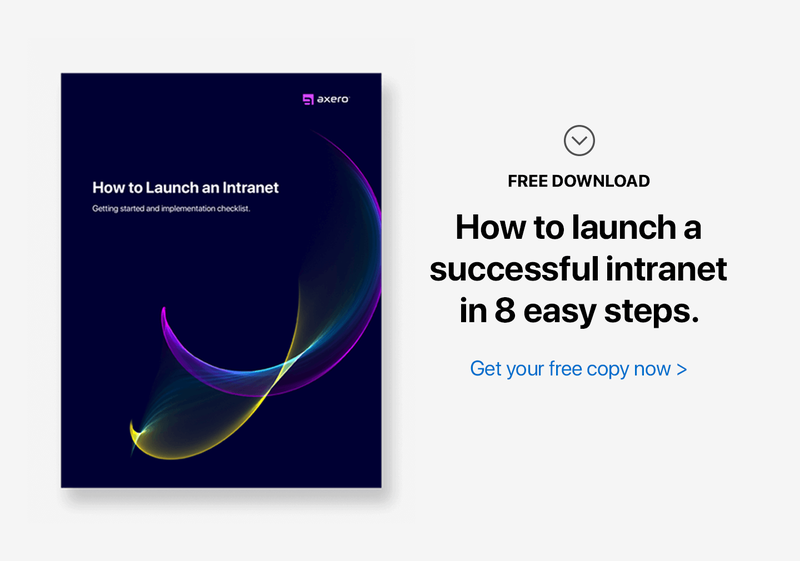 While it's true that an intranet can have a profound impact on handling day-to-day processes, those who want to get the most out of the situation should always create a detailed plan when switching to a new intranet. Content creation schedules, quotas, and other factors can all fit into your plan, and the more milestones you identify, the more benefits you'll gain from making the transition. There's simply no better way to show your staff the importance of your intranet than to lead by example. You can preach about the intranet's importance all you like, but if you're not practicing what you talk about, your staff simply won't feel the same drive to put in the effort themselves. Leading by example is easy with Communifire, as once you start utilizing your social intranet, you'll find it becomes second nature in just a short period of time. One of the most useful features in Communifire is the ability to divide the community into a number of different segments called "Spaces." Your marketing department, for example, should have its very own space in which to communicate, share files, schedule appointments, and deal with vendors. With Communifire, each space that you create is segmented from the general population, preventing information overlap and keeping your social community as organized as possible. Communifire's content creation system is an exceptionally useful feature. It can help your company develop a more thorough web presence through blogging, posting articles, and creating wikis. Sometimes, however, it can be difficult to get your staff to take the time to contribute content, which is why it's always a good idea to be as encouraging as possible. Over time, you'll notice that your internal knowledgebase will grow, and a great deal of that content can likely be repurposed for a public audience. It's easy to just sit back and assume that every member of your organization finds using Communifire to be a breeze, but you can never be sure that someone isn't a bit confused. Taking a few moments to check in with your employees can be a great way to fix whatever potential issues might be brewing, and your employees will appreciate the fact that you're looking out for them. For those who have had poor experiences with company intranets in the past, it's crucial to realize that today's best intranet software is nothing like the antiquated, out-dated options that dominated the business landscape years ago. Take Communifire for a test drive, and the differences will present themselves immediately. It is good and useful blog. It gave good information on Intranet .